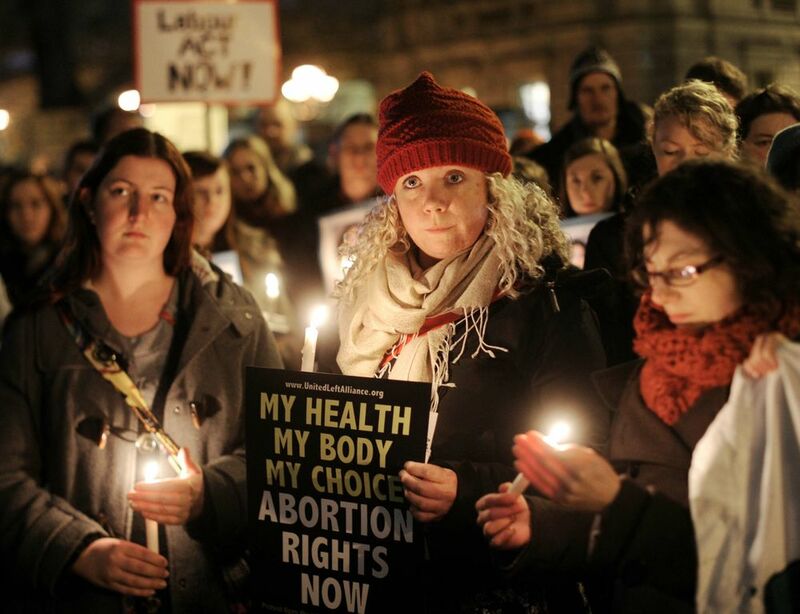 The Savita Halappanavar case has forced Irish people at last to face up to the reality of abortion. After years of dodging the issue, there is now no way of avoiding some kind of action here to clear up the uncertainty that surrounds abortion in Ireland. It's not just because of the tragic death of Savita. In the background, the European Court of Human Rights is watching what is going on here. They have already warned Ireland (in the finding in the A, B and C case taken by three Irish women) that the absence of any legal framework which will tell a woman whether under Irish law she can have an abortion or not is a denial of her human rights and that action must be taken to correct this. The Irish government has to respond soon, and the Savita case has given added urgency to that reality. Of course, the truth is that Irish women do have abortions. For years, while people here argued furiously at various times about the wording of constitutional provisions to protect both the unborn and the mother, the reality has been that abortion has been going on around us all the time. The current figure (based on U.K. data) is that 12 Irish women a day travel to the U.K. for an abortion, although the real figure is known to be higher since many of them conceal their origins when they arrive at the clinics in Britain. If we did not have the U.K. next door to us, where abortion is available under fairly liberal guidelines, we would have had abortion in Ireland years ago. Because we had the abortion escape route to Britain we could afford to be hypocritical and claim that Ireland has much higher protection for the unborn here, and as a result we do not have abortion at all. The truth is we did have abortion all the time. It's just that all the Irish abortions were done in Britain. This has been going on for decades. As we pointed out here last week, it is national hypocrisy on a breathtaking scale. It has been going on day after day, month after month, year after year. And you can be sure that it has been going on over the past two weeks as everyone here debated the tragedy of Savita, the young Indian woman who died in a Galway hospital from blood poisoning while going through a delayed miscarriage after being refused a termination. She was refused for three days because a fetal heartbeat was still detectable and "because this is a Catholic country." By the time the fetus had died and was removed, she had developed infection and septicemia killed her a couple of days later. As the debate here raged over the past two weeks, every single day, rain or shine, stormy or calm, at least a dozen Irish women were on a plane or a ferry making the lonely journey to Britain for an abortion they could not get at home. But such terminations do happen in Ireland, despite our pretence that there is no abortion here. We don't know the numbers involved because although the Irish health service collects all kinds of data, it does not collect information on how many pregnancies are terminated in Irish hospitals. We don't want to know, you see, because such statistics might make us uncomfortable. It's easy to make us uncomfortable. Even the word abortion is not something we like to hear, so when we talk about what happens occasionally in our hospitals to pregnant women who are seriously ill we use the word termination instead. It is this second way that abortion happens (or does not happen) in Ireland that has been discussed so much since the tragic death of Savita. And this kind of abortion involves just as much hypocrisy and double think on the subject as does our national amnesia about the abortion trail from here to the U.K.
On abortion/termination, the guiding principle for doctors in Ireland is the key phrase in the ruling from our Supreme Court in 1992 in a case involving a teenager who was pregnant and suicidal (the X case). This ruling stated that abortion here is legal under the 1983 amendment to our constitution when there is "a real and substantial risk to the life, as opposed to the health, of the mother." The ruling also stated that the risk could be one of suicide. This was the general principle set out by the Supreme Court's interpretation of the constitution and its 1983 amendment. But to give a detailed framework for the circumstances in which abortion is permissible here, legislation would be necessary. The Supreme Court said as much. But our politicians, terrified of the pro-life lobby, did nothing, year after year and government after government. Which is why there is no legal framework, however restricted it might be, for abortion here. The Irish Medical Council did issue guidelines for doctors which basically repeated the Supreme Court line about "a real and substantial risk to the life, as opposed to the health, of the mother." But the question for pregnant women and their doctors remains, what does this mean exactly? At what point does ill health which may be caused by or complicated by a pregnancy become a substantial risk to the life of the mother? With different conditions and diseases, this can vary greatly and also can be less or more difficult to pinpoint. So does one err on the side of caution? And if so, how far on the side of caution? And is it right to leave a decision like this entirely with a doctor or should the woman have a say -- perhaps the final say? The entire spectrum from, at one end, a woman's right to choose, to, at the other end, an entirely medical/legal decision by other people with the woman having no say, covers a great deal of complicated ground. Where you are on the spectrum can depend on where you are in Ireland. In one case in 2010 a woman with malignant melanoma was advised by her doctors to get a termination, but this was refused by Cork University Hospital because they decided her life was not at immediate risk. They did this even though delay in treatment in such cases can be dangerous. How advanced would the cancer have to be before they allowed an abortion? In her case we do not know because she went to the U.K. for a termination and she died a year later. There have been other cases where fetuses have had fatal abnormalities, meaning they could not be viable after birth, but the women involved were refused terminations because their lives were not at risk. And there are other cases (like the A, B and C cases) where family circumstances, heavy addictions or mental instability have meant that the women involved could not cope with their unplanned pregnancies and wanted to terminate them. But no guidance or rules are available here. Depending on who you talk to in the medical profession here, you can get widely varying accounts of what happens in Irish hospitals in circumstances in which pregnant women are seriously ill. The pro-life lobby says that because abortion is permitted if there is "a substantial risk to the life" of the mother, there is no reason for concern. But try telling that to a doctor in a pressured situation or a pregnant woman who is afraid of what might happen if her condition suddenly worsens. In a case like Savita's, for example, if there is some sign of infection during an extended miscarriage and there is a possibility, even a remote possibility, that this could develop into septicemia which might not be spotted in time to be controlled by antibiotics, does that count as a real and substantial risk to the life of the mother? In the absence of legislation that clearly sets out parameters for doctors to follow, the answer can depend on where you are and who your doctor is. Instead of making a firm recommendation, the report gives the government a series of options, varying from doing very little, to making regulations to new legislation. The preferred option seems to be legislation to make restricted access to abortion legal in line with the Supreme Court wording, with additional regulations to define what that would mean in practice. So abortion would become legal in situations where the mother's life is in danger, and the regulations would spell out how to establish when this is the case. Two medical specialists (not ordinary doctors) would have to sign off on a permission for a termination. There would be a system for appeal to a wider group of specialists if the woman is unhappy with the decision. What is proposed seems complex and could take considerable time, which may not be available in crisis situations. No mention is made about what to do when a woman is carrying an unviable fetus, or a fetus with gross abnormalities, and wants a termination. There is no acceptance of the principle of a woman's right to choose, no matter how critical a situation she is facing. Consequently, ideas such as giving a woman an absolute right to choose in the very early stage of pregnancy and giving her the right to choose in consultation with a doctor at a slightly later stage (up to 10 or 12 weeks) and for specified reasons are completely absent from the report. It is interesting that the thinking in the report, like the Supreme Court wording, is very close to the position of the Catholic Church, which accepts that a pregnancy may be terminated if it is an unavoidable consequence of an intervention necessary to save the life of a mother. The key test from the Catholic Church point of view is that there is no direct intention to destroy the fetus, that the ending of the pregnancy is an unavoidable consequence of necessary medical action to protect the mother's life. In other words, the termination must be an unavoidable accident that happens during the medical intervention. It's an accident that doctors know is going to happen, but it's still an accident. This is the kind of stuff that the intellectuals of the Catholic Church -- all celibate men of course -- spend years studying in theology classes in Rome and it gets incredibly complex and convoluted. Self-flagellation is nothing compared with the torture they go through delivering their lengthy pronouncements on the subject. Sadly, this report appears to be in the same category. Based on the leaks we have seen, it does not seem to be much help. Now it's up to the government to decide what to do. It's not just a question of meeting the demands of the European Court. It's because we do not want to see another tragedy like Savita.